Rylee Field, age 24, of Montpelier was crowned Miss Vermont 2016 at the historic Barre Opera House on Friday evening, May 27. Field is a graduate of Colby-Sawyer College, where she earned a B.A. in creative writing. She performed spoken word poetry to Mockingbird by Rives in the talent portion of the competition. Field has chosen “Find a Happy Place: Positive Mental Health & Wellness” as her platform for her year of service. “With the title of Miss Vermont, I plan to work closely with the many organizations within Vermont that focus on mental illness prevention, treatment, and recovery,” she said. The Miss Vermont program also crowned their teen ambassador on Saturday, May 28. 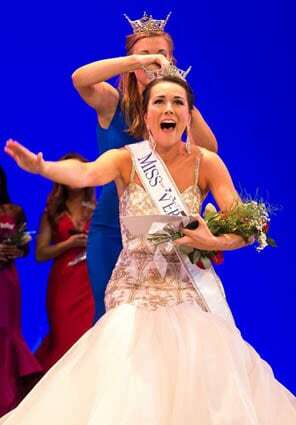 Alexandra Diehl, age 15, of St. Albans is the new Miss Vermont’s Outstanding Teen. She danced a contemporary ballet routine to “Eye of the Tiger” in the talent portion of the competition. Diehl is a sophomore at Rice Memorial High School and will be promoting her platform, Y.E.S.S. (Youths Exercising for Strength and Success). Alex Diehl will represent the State of Vermont at the Miss America’s Outstanding Teen competition in Florida this August. The mission of the Miss Vermont organization is to promote personal and professional development, civic consciousness, service, higher education, and integrity.